I think each and every one of us has at least one relationship with a family member that is “difficult.” I know that I have my fair share of these, and it can be very frustrating when no matter the effort, it just doesn’t get any better. In fact, sometimes no matter what you do, it just gets worse. What can be especially upsetting in these situations is that the love is there, abundant even, on both ends. I won’t get into the nitty gritty of my own particular brand of family dysfunction. But I will tell you that, very infrequently in my case, time does heal the wound. You know what else has helped immensely? Saying hello, with a card. Seriously. I’ve gotten into a groove with mine and can proudly attest that there are now regular withdrawals and replenishments to the shoebox where I keep my handmade cards. 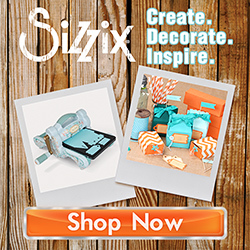 I have a recently crafted trio on the Sizzix Blog today – fast and dry in the making. Die-cuts using happy coordinated patterned papers creates instant, joyful results. Hope you’ll stop by to see the tutorial and that you, too, will make a card for someone you love. Viv! I love those words! The font is great! Can I borrow? Hi Marianne – sorry for the delayed respons I also have issues sometimes. I have to play with the tension on my machine, but what has helped me immensely most recently avoid any trouble is to use a heavy duty sewing needle, like one made for denim.